NYC, 02/28/2019, 1:15PM. Baroque and late Renaissance music. Give a gift of CFT! April 22, 2019. Free shows, concerts, movies, tours are New York (NYC) best kept secret! New York City never ceases to amaze you with quantity and quality of its free culture and free entertainment whether it's day or night, weekday or weekend, summer or winter, spring or fall, January or June, May or September. If you are looking for inexpensive things to do and where to go in Manhattan today, tonight, tomorrow, or any other time, or any other day of any week - you came to the right place: just click on any day on the calendar dispayed on the every page of our site and you will see how many events you can attend in Manhattan free of charge on that very day. New York's cultural scene is at its busiest in October and March (and the same goes for free events, free things to do), but other months of the year still offer incredible amount of high quality, off the beaten path, unique free events, free things to do which will take your breath away! So if you looking for something to do in April or November, December or February, you will find tons of free things to do, free events to go to. (In June, July and August lots of those free events take place outdoors, of course). So do not wot till tomorrow, start using these unique New York City opportunities today, April 22, 2019! Where else but in New York City can you listen to a world-class musician, discuss a book with a famous author, take a part in poetry reading, have a glass of wine at an art exhibition opening, and all that on the same day, and all that free of charge, and all of that on any day of the year, whether it's December or July, April or November! The trick is to know about those free events, free things to do BEFORE they happen, not after the fact. That's where Club Free Time comes in handy! Become a Club Free Time member and start using these unique New York City (NYC) opportunities today, April 22, 2019! Club Free Time is your perfect guide to Free Entertainment and Free Culture in the City That Never Sleeps. Free things to do, free events that take place in the City every day of the year are truly amazing. So if you're looking for something interesting to do today (April 22, 2019) or on any other day of the year don't miss those free-of-charge opportunities that only New York provides! You can find lots of high quality, off the beaten path, unique free events, free things to do which will take your breath away! In addition to providing information about free events, free things to do in New York, Club Free Time offers its members complimentary tickets to classical music concerts, dance performances and theater: when a producer wants that special buzz of the 'full house' - Club Free Time members are welcomed for their enthusiasm and sophistication! Get a taste of free culture and free entertainment in New York City (NYC)! 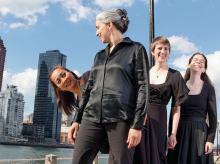 Anima performs music of the Baroque and late Renaissance. Anima specializes in music of the Baroque and late Renaissance for voice, violin, and harp-based continuo. Together since 2005, Anima brings the music and culture of the 17th Century into focus for today’s listeners with intimate and engaging concerts. The group toured Arkansas, Mississippi, and Tennessee with both concerts and educational programs. Sorry, you must be a member to see the location of the event. Not a member? Join the Club! All events are free unless otherwise stated. All programs subject to change. Please confirm before going. © Copyright Club Free Time. All rights reserved.